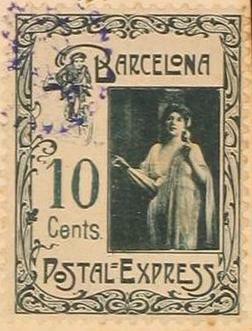 5 Cents. 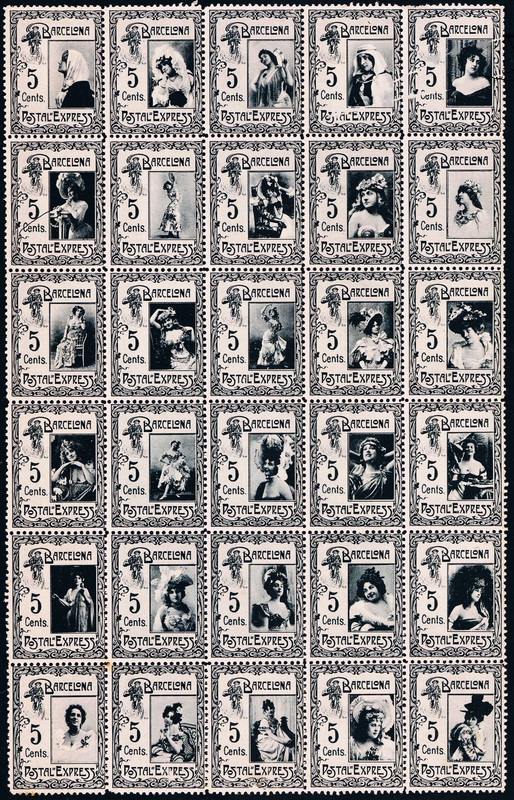 color: black - promotion material (see complete sheet)? 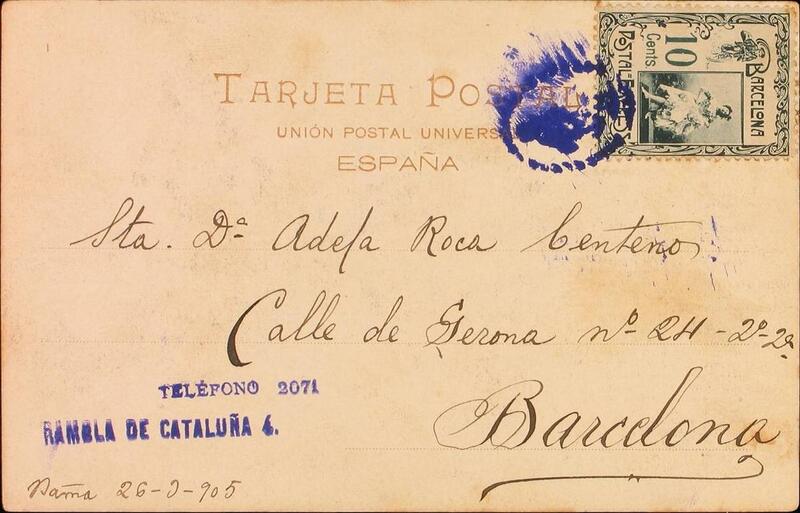 Mail forwarded to the Spanish Post sent to recipients outside the city borders of Barcelona? 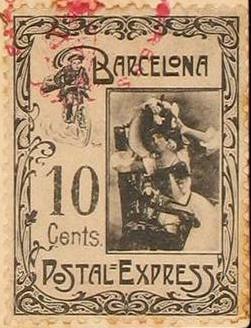 It is said that it was also combined with 25 Cents. 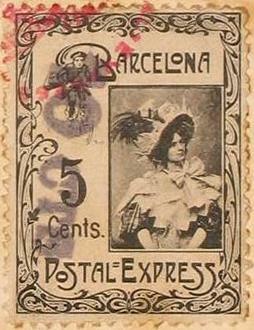 25 Cents. 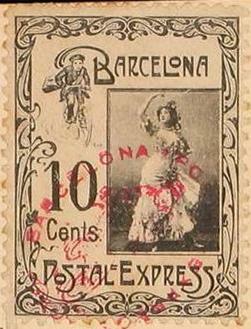 never spotted; it is said that it was combined with 5 Cents. 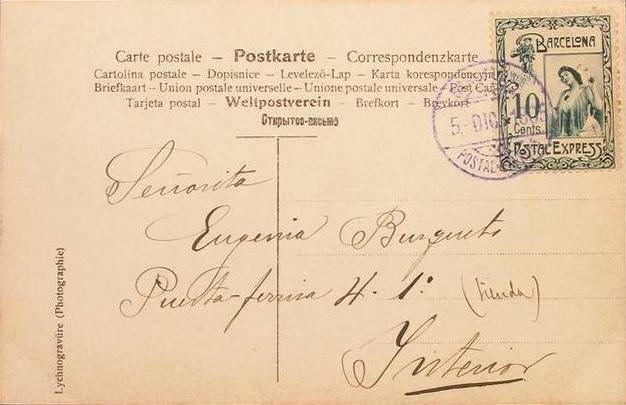 The messenger perhaps handed over the urgent items to the recipient personally ? 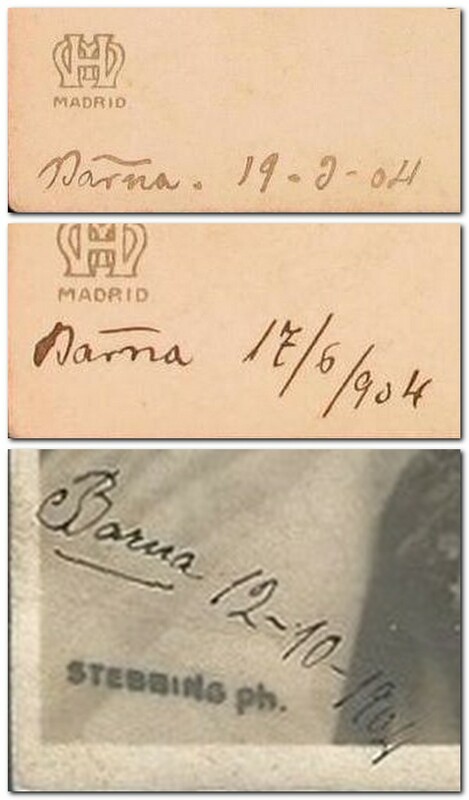 It looks “made” for a collector. 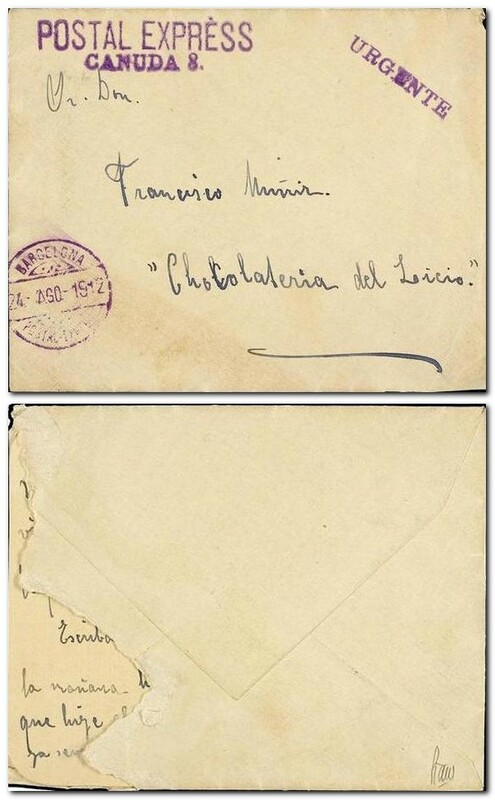 The text confirms this "... 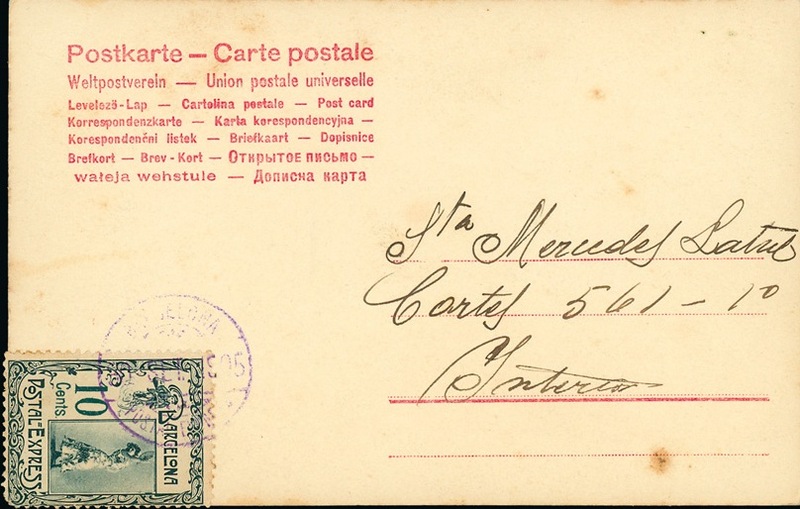 I hope this modest postcard will have place in your collection....". 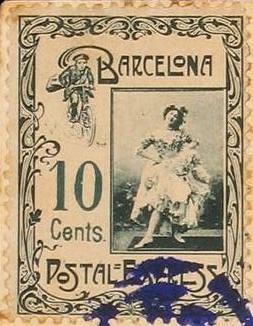 Maybe the high face value of 50 céntimos includes the cost of the postcard? 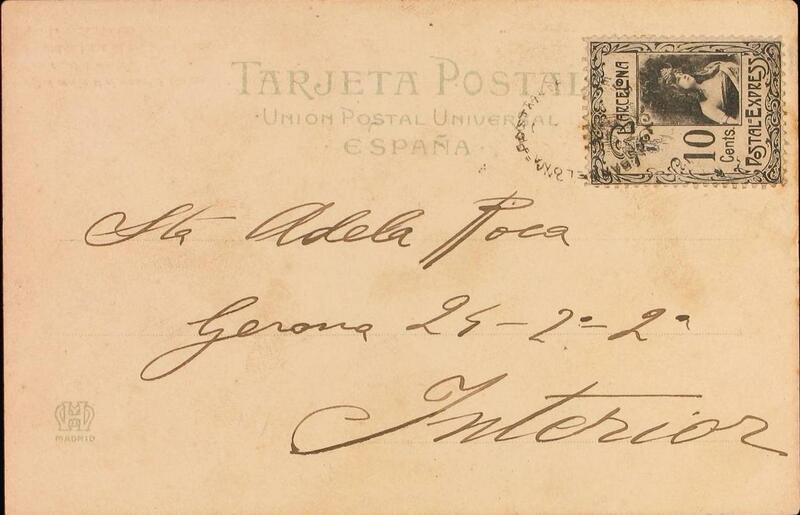 It is additionally franked with a stamp of the Spanish Post. 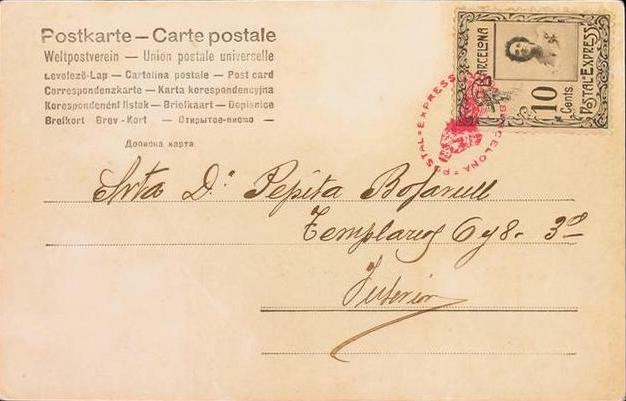 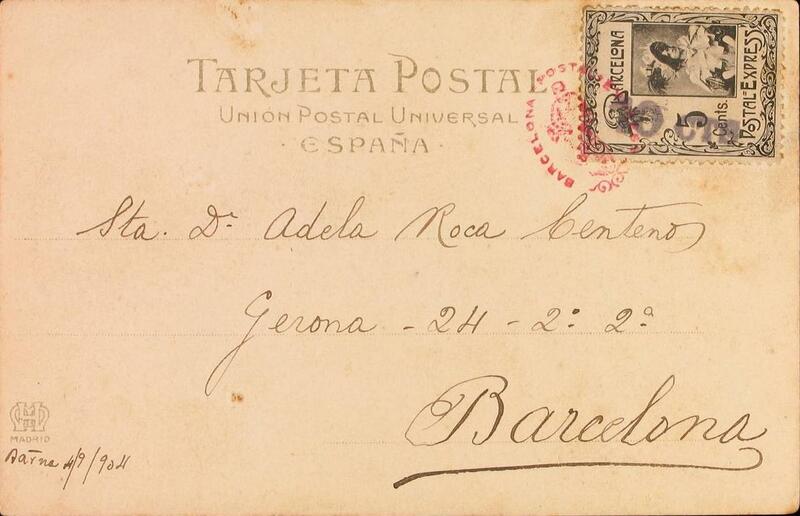 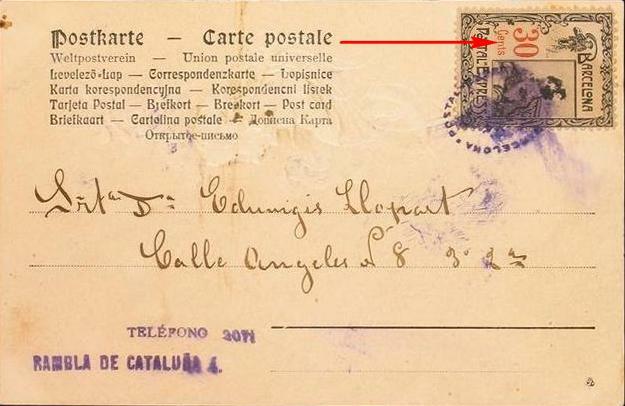 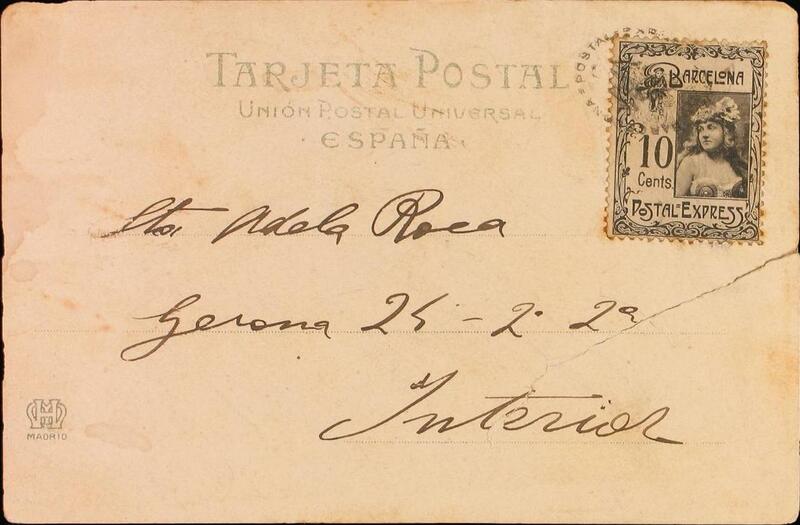 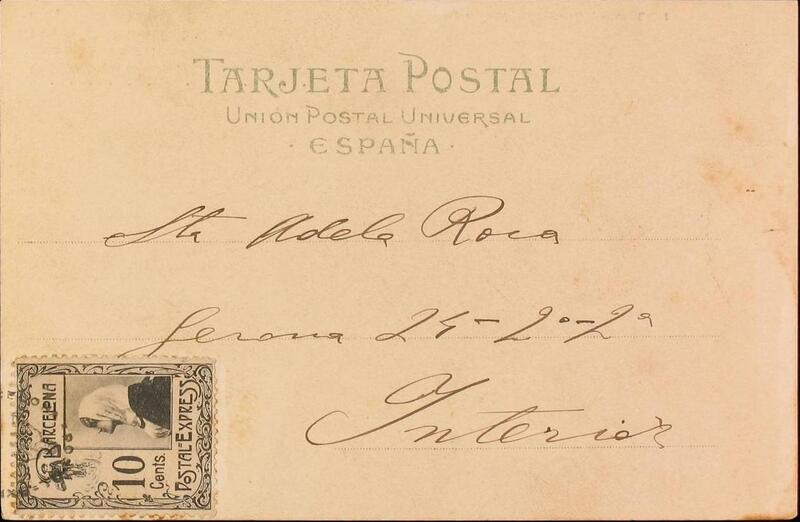 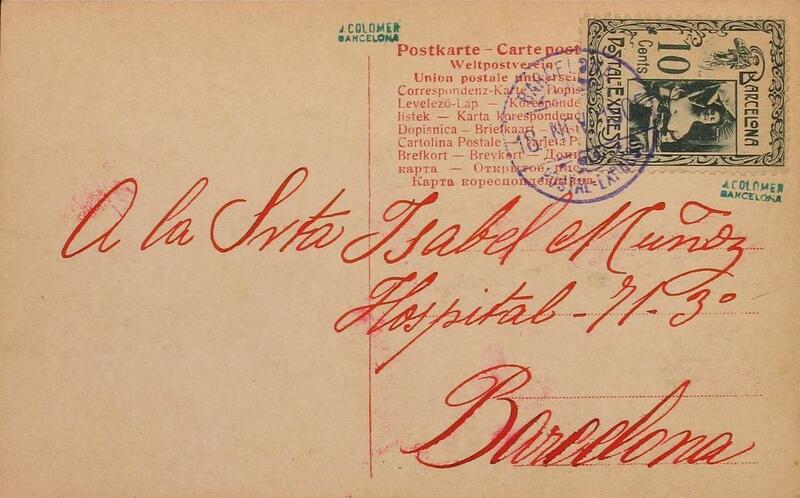 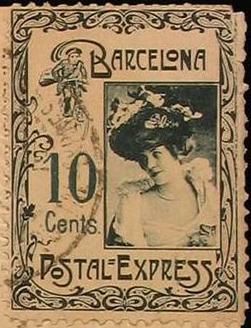 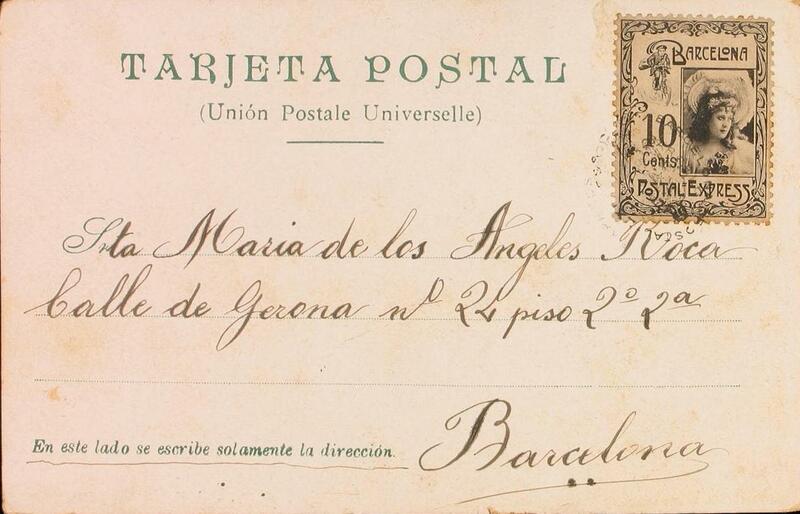 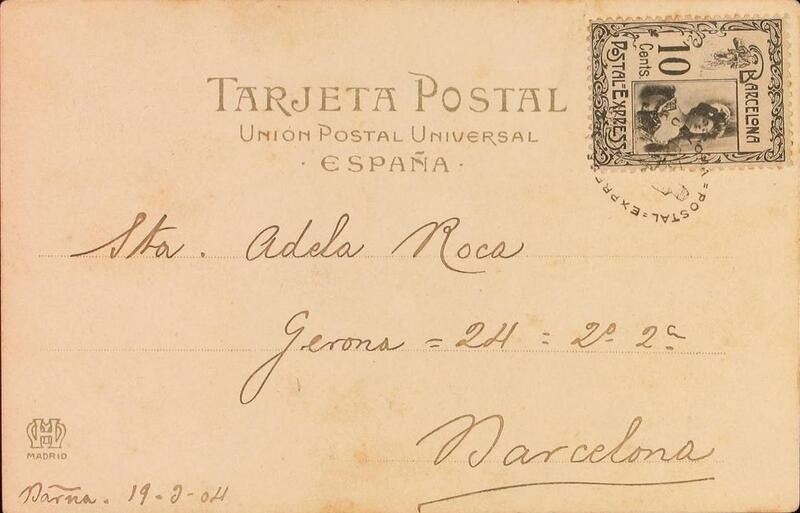 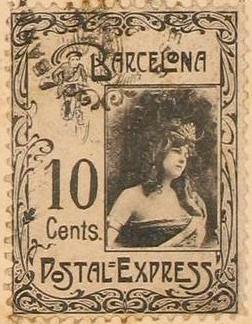 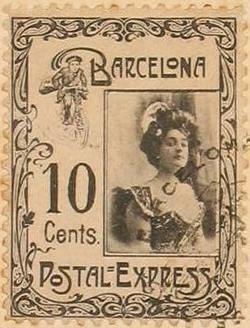 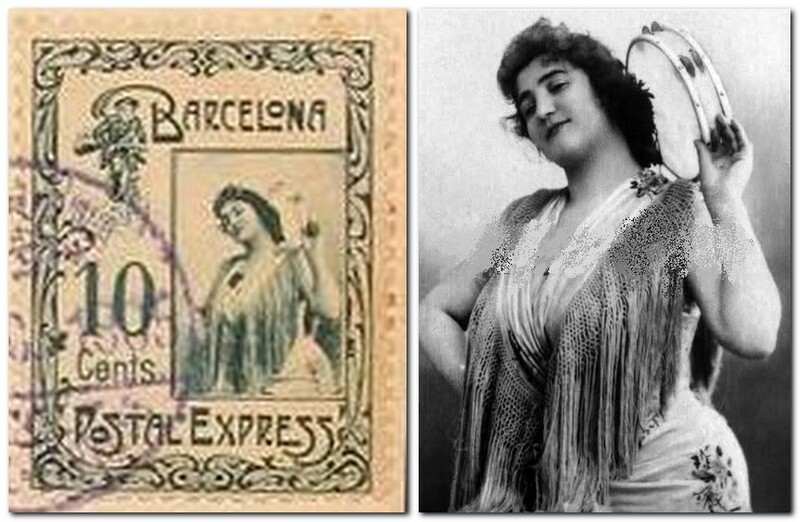 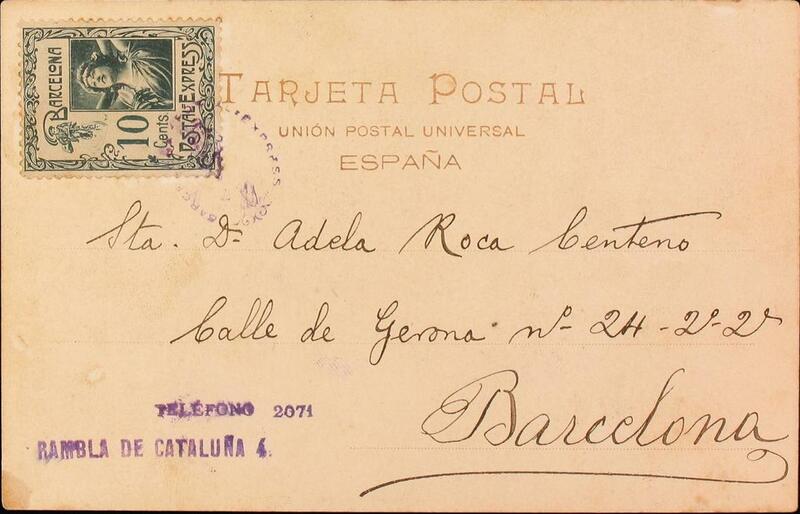 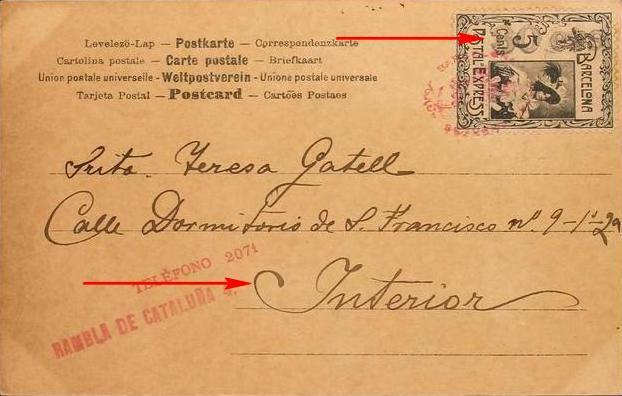 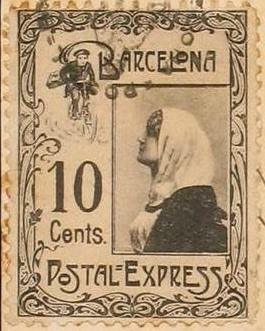 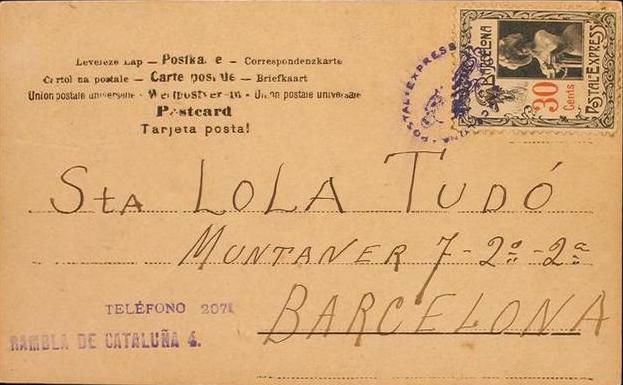 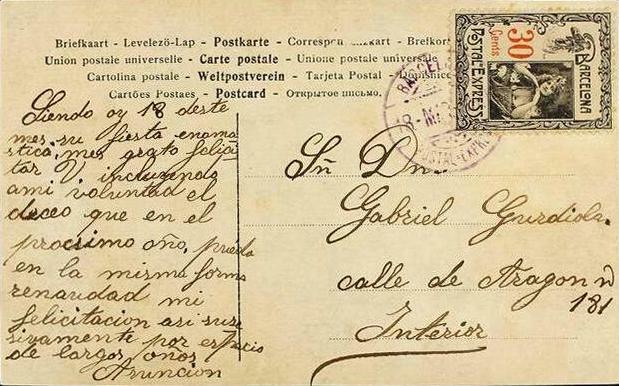 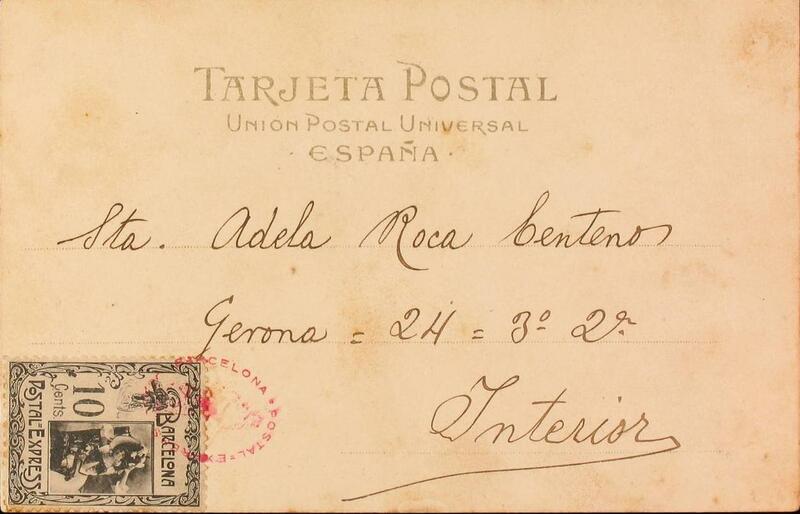 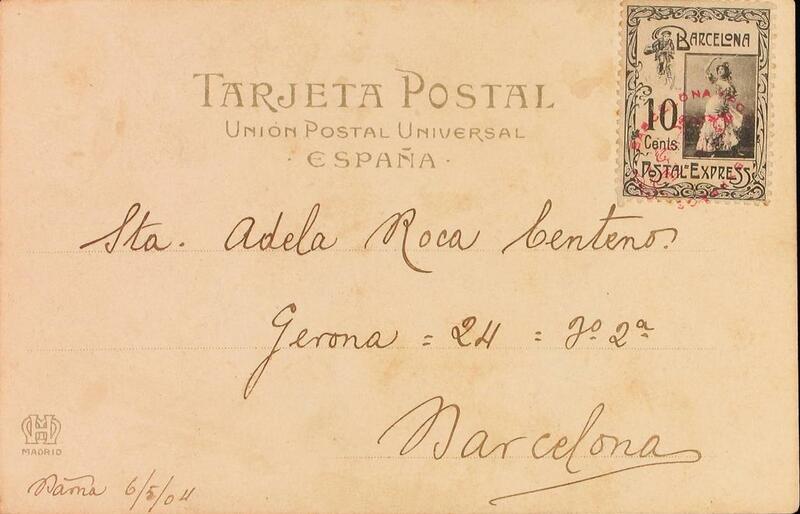 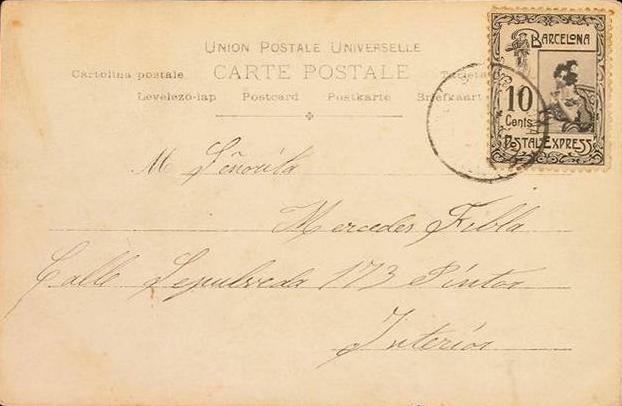 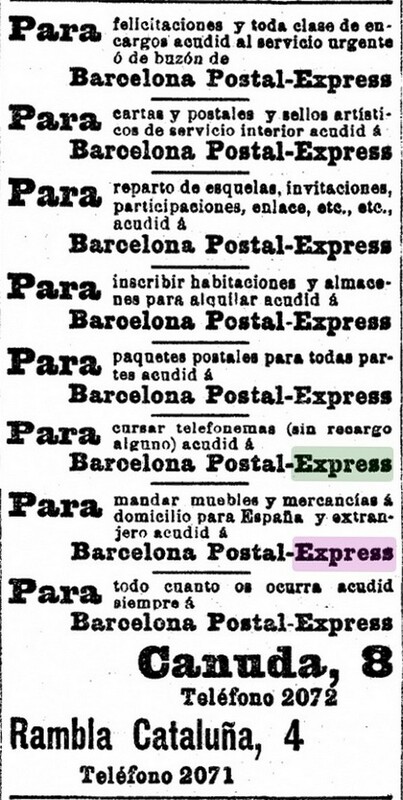 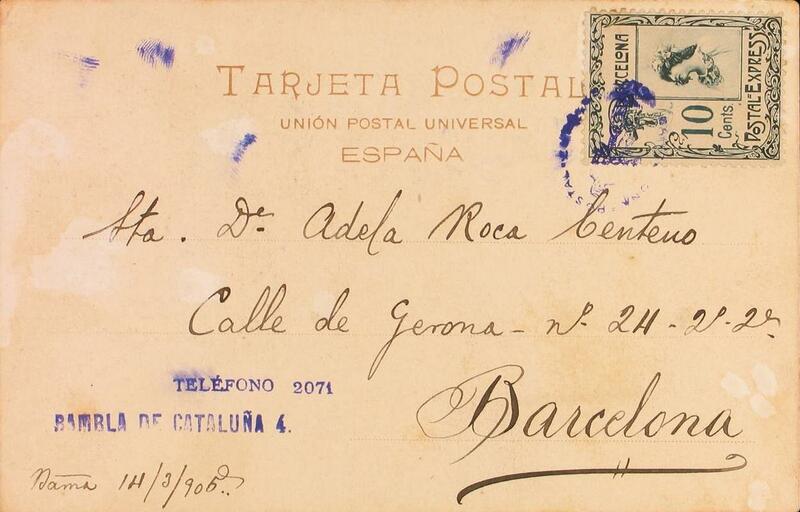 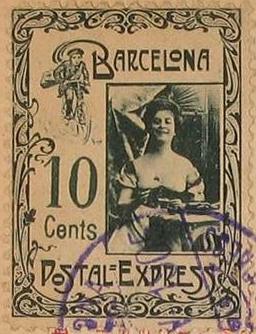 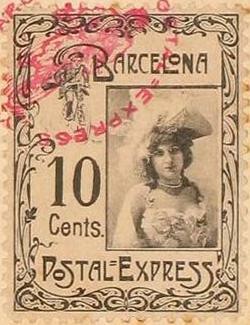 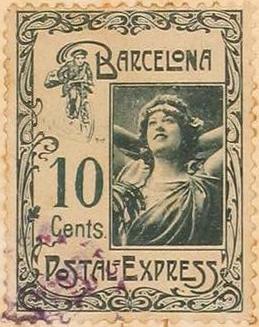 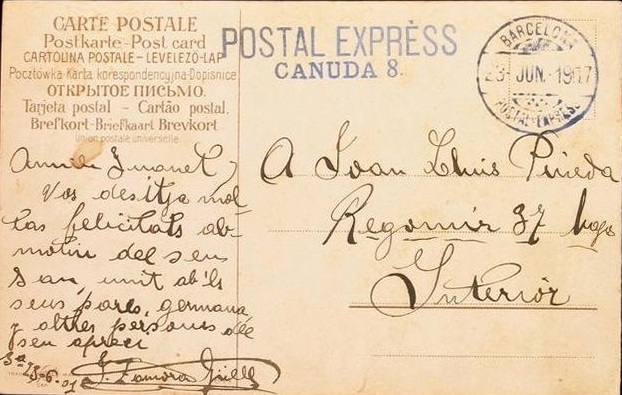 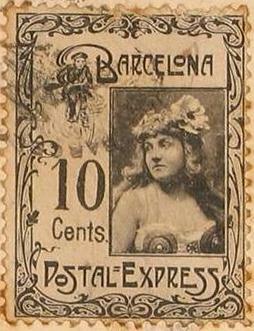 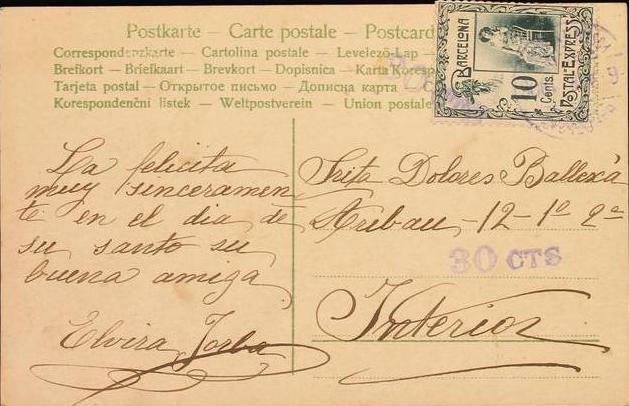 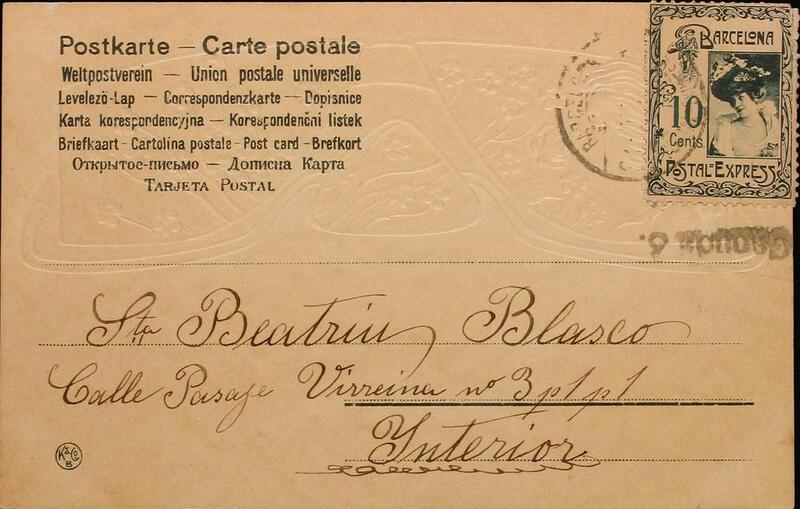 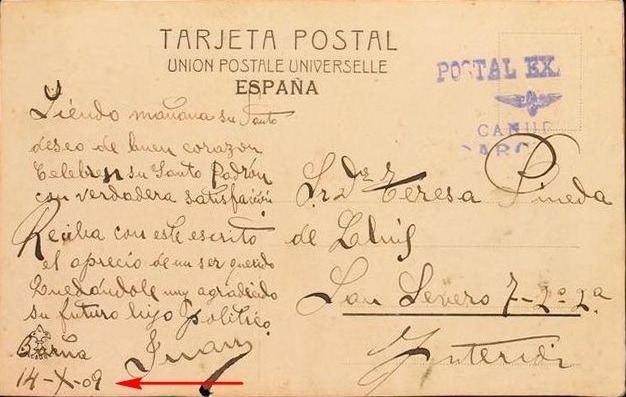 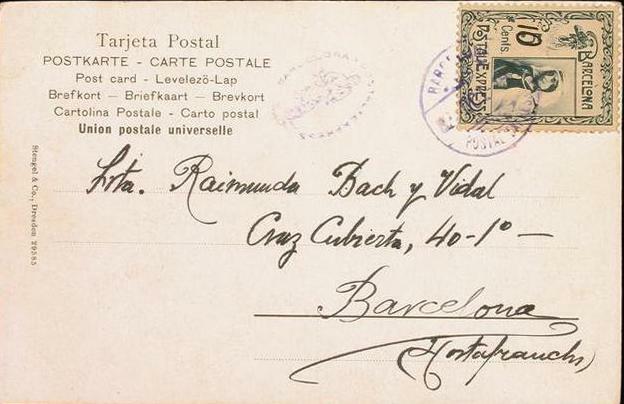 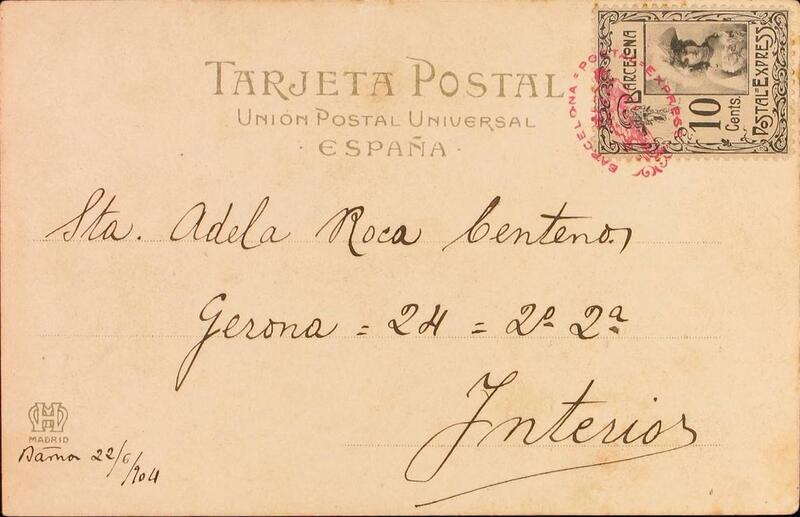 The Barcelona Postal Express cancellation is dated July 6th, 1904 - that of the Spanish Post the day after. 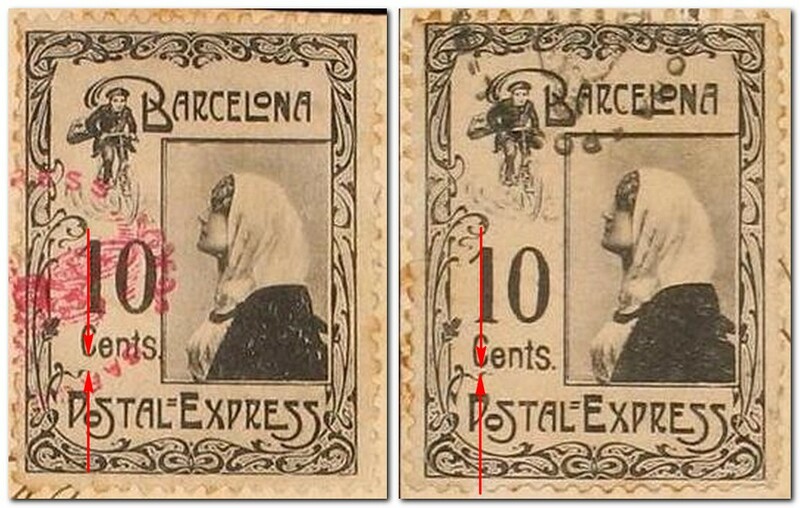 Maybe the postage was reduced from 10 to 5 Cents. 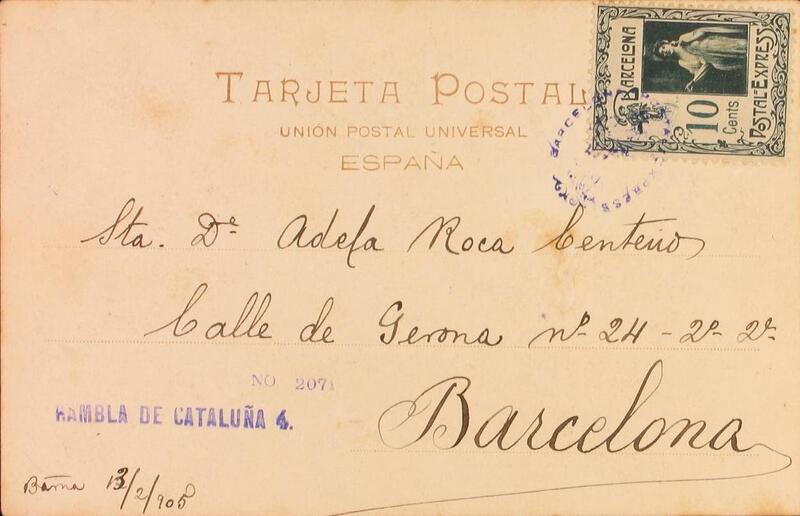 because the card was only to be delivered to the nearby post office and not individually somewhere in Barcelona - who knows? 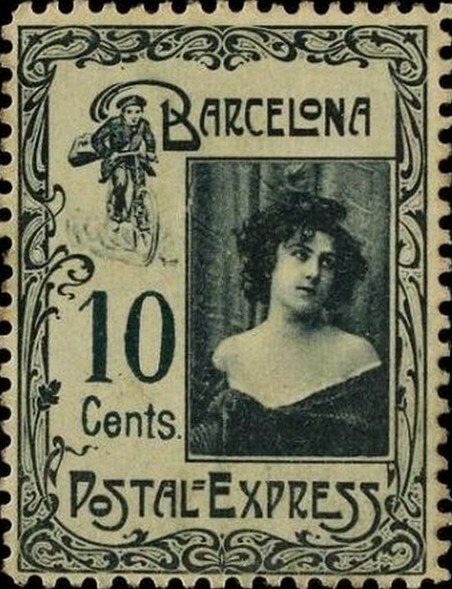 If you have any further evidence/documents about the use of this or other face values, please send a scan to contact[at]bicyclestamps.de. 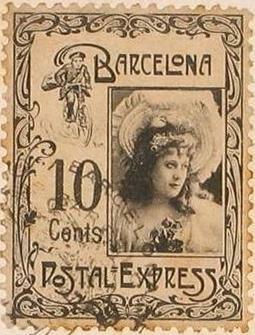 as well as perforated and imperforated stamps. 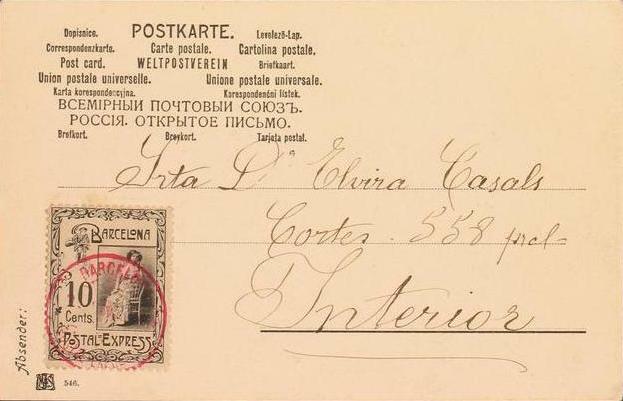 delivery of obituaries, invitations, announcements, weding cards, etc. 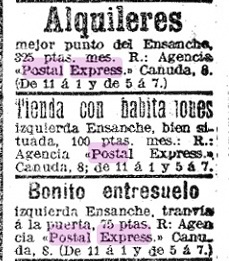 everything that happens to you"
Click to see original newspaper page. 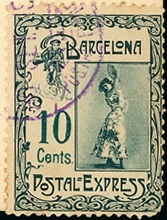 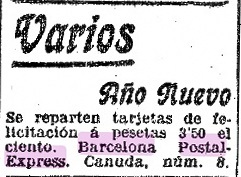 Astonishingly, the "Barcelona Postal Express" stamps were first mentioned in a book from 1976. 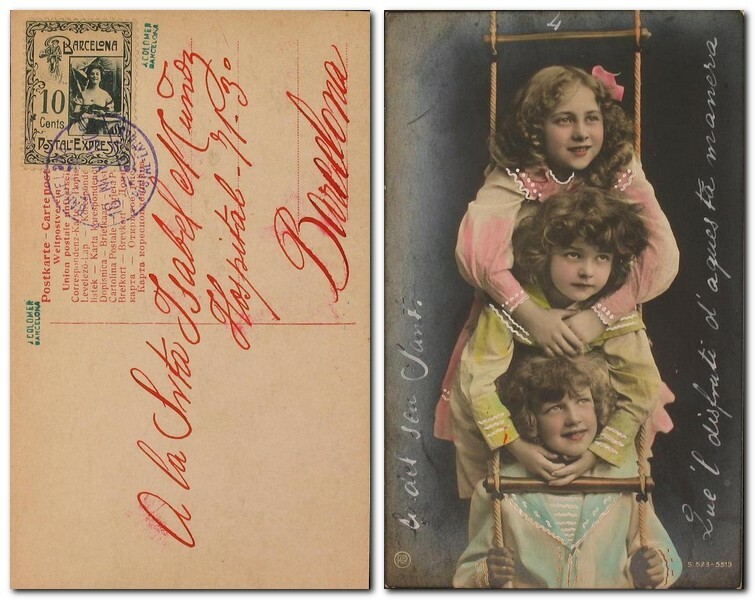 They were initially classified as cinderella by Charles and Francis Kiddle and by Christer Brunström. 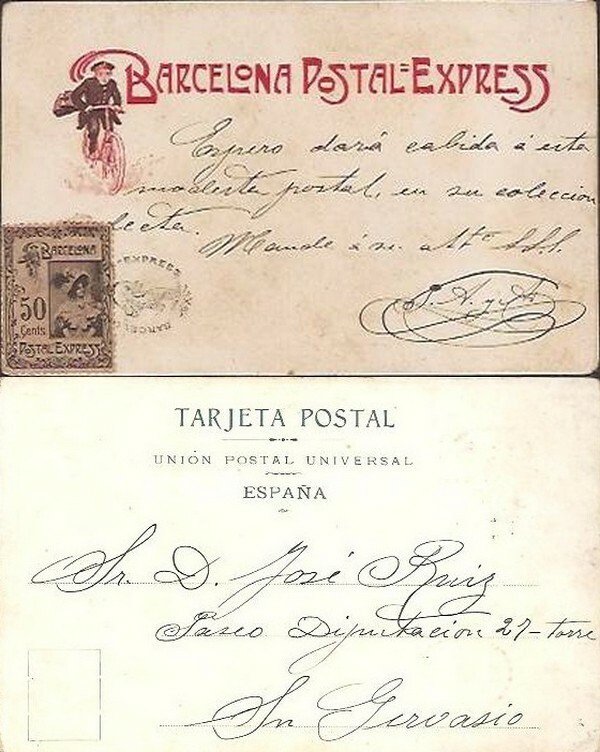 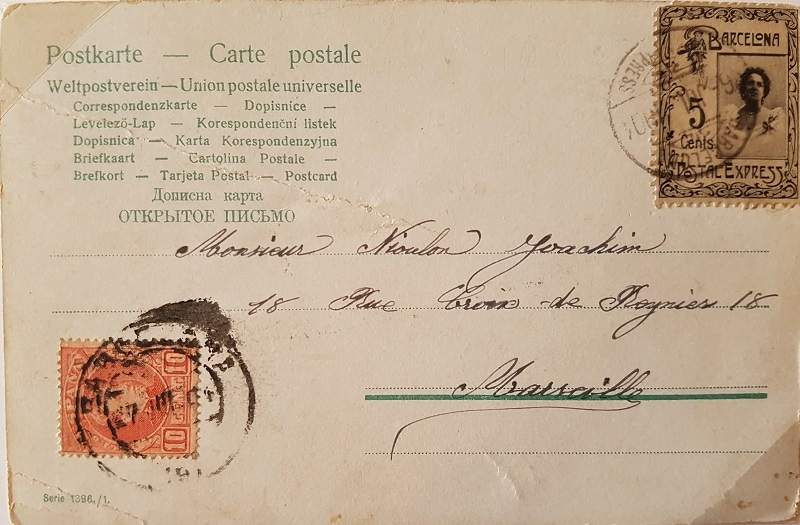 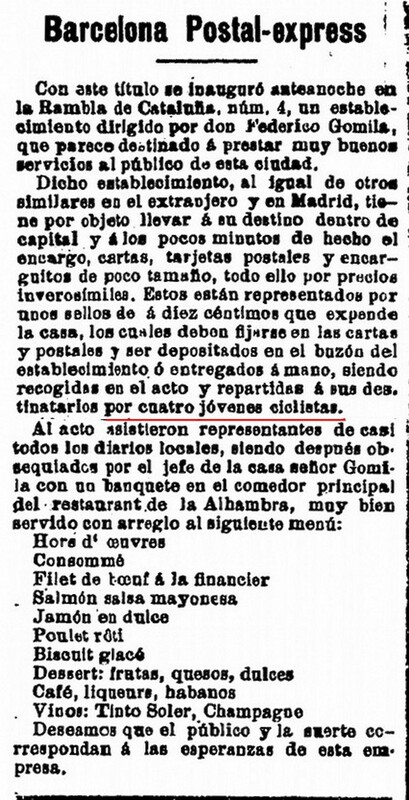 However, the article in the newspaper La Dinastía, the above letterhead and the many postcards that have appeared in the meantime prove that the company actually carried mail. 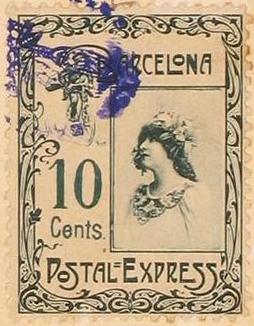 The stamps are listed in the Spanish Filabo catalog. 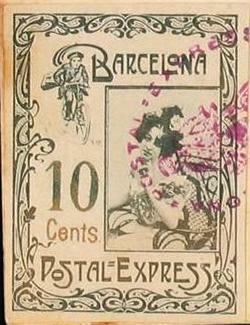 Some values - newly discovered in the recent years - are not included in the 2008 edition. 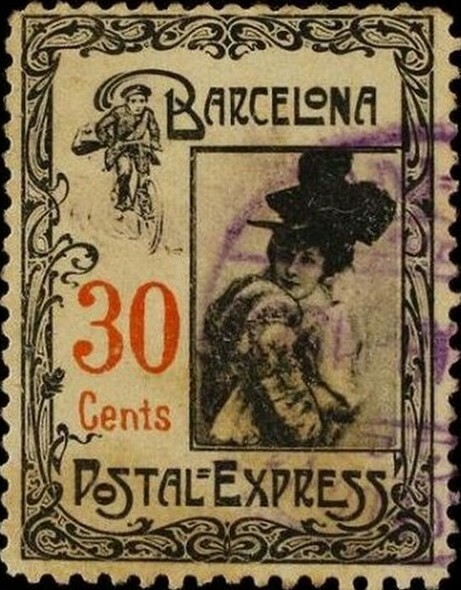 In any case, the Barcelona Postal Express issues enrich our topic “bicycle stamps collecting”, and from the combination of the 30 ladies with the numerous face values, overprints, color and perforation variants an exclusive, many hundred objects including collection can be put together. 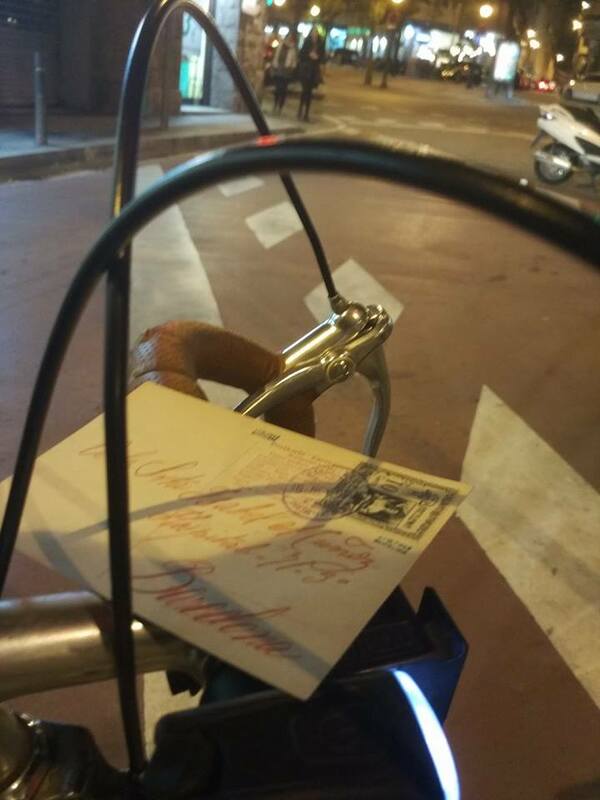 All you need is a well-filled wallet and a lot of patience. 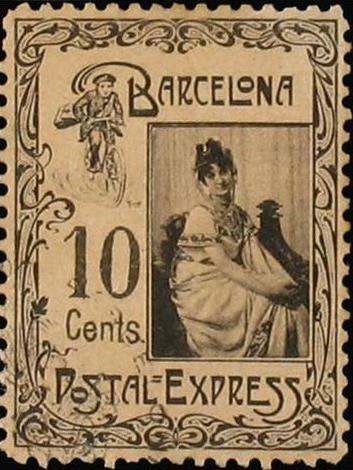 In the online catalog of BICYCLE PHILATELY you find these items in the category local stamps.